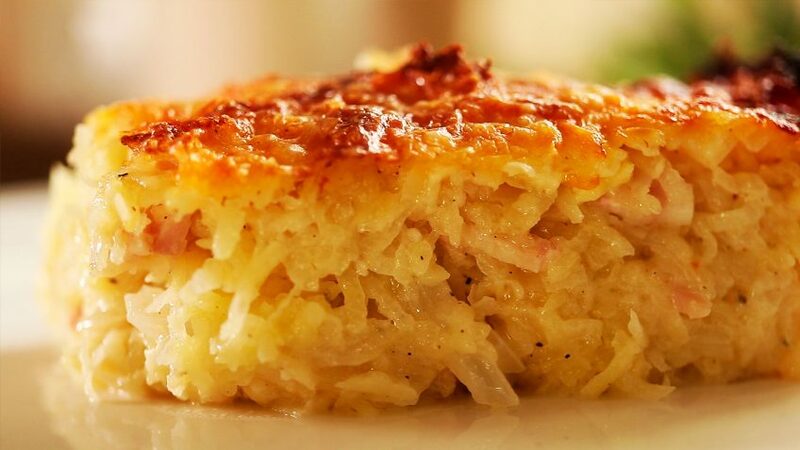 If you like hash browns with bacon and potato gratin then this is for you. Adapted with an American twist for the best of both worlds. Textured creamy soft potato on the inside with bacon and onion and a crusty cheesy outer layer makes this one of the best potato dishes you will taste. Peel the potatoes and grate them using a food processor with grater attachment or use a hand box grater. Transfer to a colander and rinse under cold water. Place in a clean kitchen towel and wring while squeezing out as much water as possible. Place the grated potatoes in a mixing bowl and add the cream, nutmeg, salt and pepper to taste. Mix well and leave aside. Remove any bacon rind then slice finely into fine lardons. Add to the potato mixture. Grate the cheese and add approximately half the quantity to the potato mixture. Mix all ingredients well. Grease an oven proof baking dish with olive oil, sides and bottom. Add the potato mixture, and flatten so it’s level. Cover with foil ensuring the foil does not touch the mixture and place in oven. Bake for 45 min at 400°F – 200°C. After 45 minutes, remove foil and leave in oven another 15 minutes at 350°F – 180°C for 15 to 20 minutes or until nice and brown. Leave to cool 20 minutes before cutting up and serving. You can keep some extra bacon lardons and sprinkle on top with the cheese.